London is made up of distinct neighborhoods, each with their own character and style. There are reasons to visit every corner of the city but we've focused on 10 of the best areas to explore, whether you're looking for cute pubs, posh shops, or riverside strolls. Between London's underground rail system, the tube, the bus system, and an occasional taxi ride, it should be fairly easy to reach the neighborhoods. This affluent area sits between Hyde Park and the glittering West End. Mayfair is home to the city's largest concentration of five-star hotels and some of the highest rents in London. By day you can shop for tailored suits on Savile Row, designer gear on Bond Street, or art in many of the area's independent art galleries. By night, it's all members' clubs, wine bars, and posh clubs. This buzzy east London 'hood is packed full of hipster coffee shops, cool bars, and vintage shops and markets. It's strewn with street art and many of its former industrial warehouses are now restaurants and clubs. Old Street is known as Silicon Roundabout for its concentration of tech startups and attracts techies from around the world. Spitalfields Market, with its stalls selling clothes, art, and food, draws large crowds on the weekend. This well-heeled west London neighborhood hugs the north bank of the river Thames and is home to pretty squares flanked by multi-million-pound townhouses. The area's main artery is the King's Road, which is lined with high-end shops, cafes, and restaurants. It's bookended by the Saatchi Gallery, a center for contemporary art and Stamford Bridge, Chelsea Football Club's home ground. It plays host to the Chelsea Flower Show each May. This leafy neighborhood in southeast London feels like a real escape from the city. Greenwich has a rich maritime heritage and is home to the Royal Observatory where you can straddle two hemispheres at the Prime Meridian (Longitude Zero). Every place on the Earth is measured in terms of its angle east or west from this line. Its historic center is a UNESCO World Heritage Site and pretty Greenwich Park served as Henry VIII's former hunting ground. Head up to the top of the hill for dramatic views of the London skyline. The covered market is packed with stalls selling antiques, art, crafts, and food. This historic 'hood on the south bank of the Thames is packed full of cultural gems including The Tate Modern (art museum) and the Shakespeare's Globe Theatre. Borough Market attracts foodies from across the globe and Maltby Street Market, with its food stalls set in railway arches, is a hit with locals. Southwark Cathedral stands in the shadow of the futuristic Shard, London's tallest building. The borough is home to hipster enclaves Bermondsey, Camberwell, and Peckham. Neighborhood highlights: Borough Market, Southwark Cathedral, Bermondsey Street, Tate Modern, Shakespeare's Globe Theatre, the Shard, Tower Bridge. This dynamic and culturally diverse area in south London attracts foodies from across the city to its historic covered market lined with food stalls, quirky boutiques, and independent restaurants serving every global cuisine you can think of. Elsewhere in Brixton, you'll find a cool arthouse cinema, one of London's best music venues and tons of cool bars and eateries. Parts of Notting Hill look straight out of a film. And that's probably because the neighborhood is synonymous with the 1999 Brit flick of the same name. The area's quaint streets are lined with colorful townhouses and its famous market (Portobello Road) is flanked by stalls selling antiques, trinkets and vintage clothes. The streets come alive every August when the area plays host to the world's second largest carnival (after Rio). 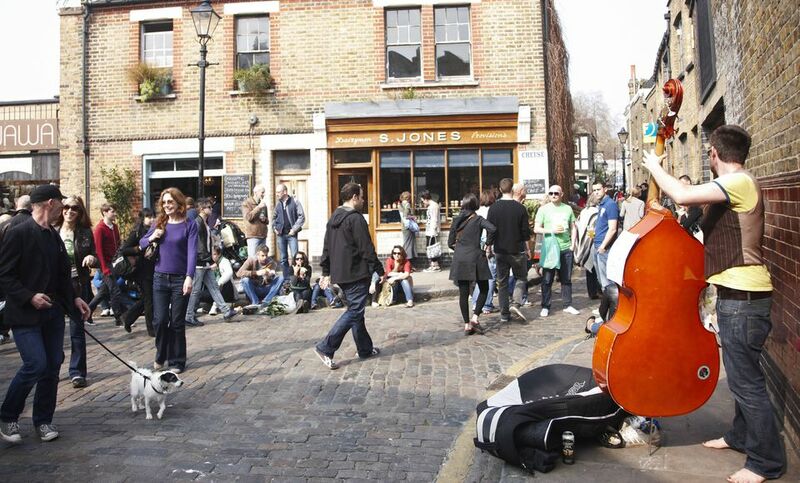 Colorful Camden is one of the best places in London to see live music. From the iconic Roundhouse, a converted steam engine repair shed, to countless dive bars that play host to small indie bands, this neighborhood rocks. Its street markets sell everything from jewelry to artwork and clothes to vintage furniture. Stroll along the Regent's Canal to the park of the same name, past the zoo. Or take a water bus from Camden Lock to Little Venice. The neon-lit streets of Soho are lined with record stores, coffee shops, hip bars and restaurants serving food from across the globe. London's entertainment hub, buzzing day and night, forms part of the glittering West End. Soho's theaters show blockbuster plays and musicals. You'll find countless pubs filled with the media professionals that work in the area and a thriving LGBT scene around Old Compton Street. This wealthy neighborhood in west London is home to three of the city's best museums: the Science Museum, the Natural History Museum, and the Victoria & Albert Museum. It's bookended by beautiful green spaces, Hyde Park and Holland Park, and has a high street flanked by stores for shoppers of all budgets. Factor in Kensington Palace, a royal residence since the 17th century, and there are plenty of reasons to spend a significant amount of time exploring this decadent district.